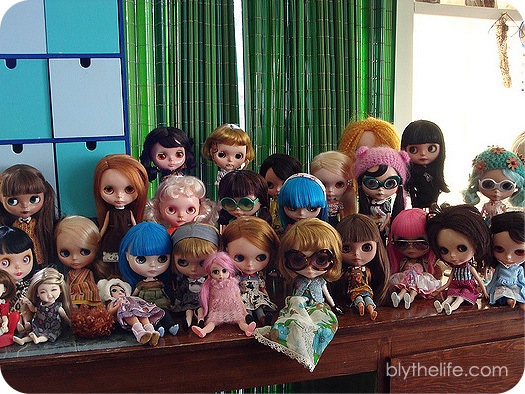 BlytheLife.com » When did I get so many dolls?! When did I get so many dolls?! I was recently having a conversation with a friend who asked me how many dolls I had now, and my go to answer was “Ummm… *mentally does some math* 16 Blythes with uhh, 2 Middies and 4 Petites.” This brought up the response of “Wait, weren’t you at like 8 recently? When did you get so many?”. That is an excellent question (sort of), and I try not to think too hard about how many dolls that I have or how quickly I’ve acquired them, but it really isn’t that quick as one would assume. I’ve been collecting and acquiring dolls since 2009, so coming up on 7 years in June. 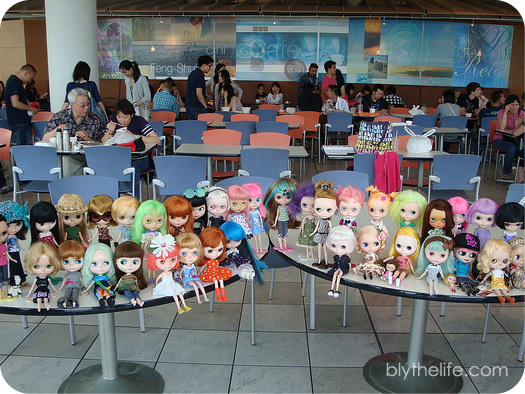 In 2009, I got my first three Blythes (Sophie/Cappuccino Chat, Belarus/Love Mission, and Tertiary Jane/Simply Peppermint) and I maintained that increase by three dolls per year for a while. In 2010, I went up by three (Bennett/Margaret Meets Ladybug, Eden Mouse/Punkaholic People, Kindred/Velvet Minuet) as did 2011 (Emmalynn/Kenner, Moxie/Simply Bubble Boom, Mollie/Simply Sparkly Spark). 2012 saw me go up by three as well, but with two of the three being Kenners (Primrose and Lillian Rose), as well as my first custom (Halo, a Friends With Blythe customized Prima Dolly Saffy). I also added three in 2013, are you noticing a trend yet? I added Kitty Brighton (Jackie Ramone Middie) as my first Middie, Cedar (Monique Magnifique), and Minnow (Hi-Ho! Marine). If I had been adding at a rate of three per year, I would be up to 21 by the end of this year and so far I’m doing okay! 2014 saw me only add two dolls to the family (Cameo, another Friends With Blythe custom; and Lydia Melbourne, a Yellow Marshmallow Middie). In 2015 I did amazingly well because I was scrimping during my unemployment (and saving for BlytheCon Vancouver spending money) and only added one doll to the family – Lark, the I.G. Sirenita Petite who was a gift from my sister (after she’d won her from the raffle), although I usually don’t “count” Petites into my doll count because they’re so small and I only have four right now. And then that takes us to 2016, where I’ve added one Petite and one Mondrian. If we don’t count the Petites (which I often don’t – sorry little ones! ), that means that I average about 2.25 dolls per year. Which isn’t bad! I do have plans on adding an ADG soon, to round out the family a little bit, so that’ll skew with my numbers a little bit – but overall it’s not a huge surplus in dolls all the time. If I had the money, I’d probably increase the size of my collection by more than two-to-three dolls a year, but as it currently stands I have more pressing matters to contend with when it comes to if I can spend money on dolls (the answer is usually no, but that doesn’t stop me from watching auctions and paying attention to what’s going online when it comes to buying/selling dolls). QOTW: How many Middies or Petites do you have? I consider myself an obsessive collector and I have noticed that whenever I start collecting something new, there will come a time when the collection grows exponentially on a whim. For example, 2015 was an extremely good year as my doll family gained 26 new members. I still don’t know how that happened, but I’m grateful I had the opportunity to do it.